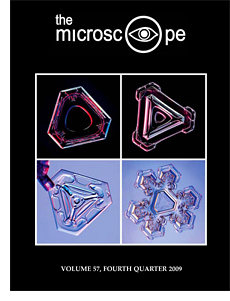 On the cover: Examples of natural snow crystals exhibiting triangular morphologies. The equivalent diameters range from 1 to 3 mm. The lower right example shows a crystal with an initial truncated triangular morphology (outlined by the central surface markings) that subsequently grew plate-like branches. See “Aerodynamic Stability and the Growth of Triangular Snow Crystals” by K.G. Libbrecht and H.M. Arnold. Copyright © 2009 Microscope Publications, Division of McCrone Research Institute. All rights reserved.